In 1996, in Qinzhou, 400 kilometers southeast of Beijing, a team of diggers discovered in a pit of sixty square meters and two meters deep, fragments of stone Buddhist statues arranged with care, often incomplete. Some showed traces of fire, others of repairs.The school, where the statues were found is built on the site of Longxing Temple destroyed by fire in the fourteenth century. Approximately four hundred statues have been reconstructed; thirty of the most beautiful pieces are displayed in the museum with special care for lighting and presentation. 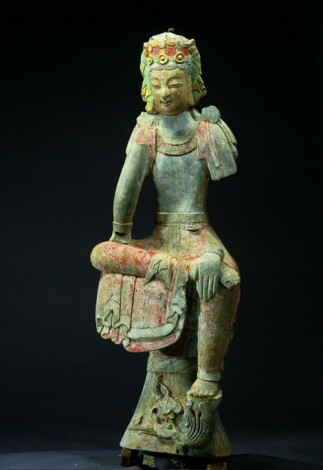 The sixth century was the golden age of Chinese Buddhist sculpture. Most of these works date from this period. Shandong Province has been an important center of Buddhist culture as evidenced by further discoveries of lesser importance. Moreover, its location has played a key role in the transmission of the faith and of this art to Japan and Korea. Already in 412, the Chinese monk Faxian stayed in Qinzhou to translate the writings he had brought from India. A few miles from Qinzhou, the Tuoshan mountain houses five caves with hundreds of stone Buddhas, most of which date from the late fifth century. During this very unsettled period, Shandong is controled by the Northern Wei Dynasty, a dynasty from Tuoba origin, a tribe of nomads from Manchuria and eastern Mongolia. The first capital of this dynasty is Datong four hundred kilometers west of Beijing. A city, now polluted by coal mines, but where you can visit the finest collection of Buddhist grottoes in China with those of Longmen and above all Dunhuang (which was presented last year by the Cultural Center of China and the Guimet Museum ). In a few years, the styles changed. 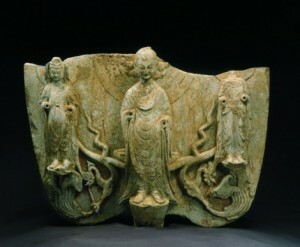 The influence of the Wei and of the style of Yungang (Datong) is clear in triads in high relief (a central Buddha surrounded by two bodhisattvas): a style a bit stiff, influenced by Central Asia but already with Chinese dragons. Then the bodies become longer, more fluid and there is a synthesis between Indian Gupta art and Chinese traditions. What is exceptional, are the traces of polychromy, and in some cases gilding for large sandstone statues of about two meters high. The seated Bodhisattva (photo above), thoughtful, with one leg stretched out is a work of the second half of the sixth century with a face carved in the Gupta style with Chinese ornaments, jewelry and dragons. This is a masterpiece of Asian sculpture. You can visit the permanent collections of a museum which has been restored and altered four years ago, or follow the lectures on the history of Buddhism in China and the Buddhist caves.